Negroponte fills "a pivotal foreign policy position that has been vacant since Robert B. Zoellick resigned to take a post at Goldman Sachs," Mark Mazzetti of the New York Post wrote. He is married to Diana Villiers Negroponte. Negroponte was nominated February 17, 2005, by President George W. Bush "to be America's first national intelligence director." "Bush said that Negroponte understands global intelligence needs because he's had a long career in the foreign service. Bush also said that Negroponte will make decisions on the budgets for the various intelligence agencies. ... 'John will make sure that those whose duty it is to defend America have the information we need to make the right decisions,' the president said." When, in early 2001, Negroponte was nominated by Bush to be appointed as United States Representative to the United Nations, human rights groups opposed, and a concerned Senate questioned, his nomination, causing a six-month delay in his ulimate appointment, which was acceeded to after September 11, 2001. Despite his complicity in supporting Nicaraguan death squads during the Iran-Contra affair and his support of the brutal military dictatorship of General Gustavo Alvarez Martínez in Honduras, Negroponte's Senate confirmation as U.S. Ambassador to Iraq went smoothly. In November 2002, it was Negroponte that was U.S. point man steering a compromise resolution through the United Nations Security Council stepping up the pressure on Iraq. "As we have said on numerous occasions to Council members, this Resolution contains no 'hidden triggers' and no 'automaticity' with respect to the use of force. If there is a further Iraqi breach, reported to the Council by UNMOVIC, the IAEA, or a member state, the matter will return to the Council for discussions as required in paragraph 12. The Resolution makes clear that any Iraqi failure to comply is unacceptable and that Iraq must be disarmed. And one way or another, Mr. President, Iraq will be disarmed," he told the Security Council. Negroponte faced contention over U.S. intentions during the U.N. debate leading up to the war in Iraq. In March 2003, Negroponte "walked out ... after Iraq's ambassador accused the United States of trying to exterminate the Iraqi people. ... Iraq's U.N. envoy Mohammed Al-Douri charged that the United States had arranged for contracts to rebuild Iraq in 1997, six years before the U.S.-led war began [on March 19, 2003, and] had even planned the carving up of Iraq before Iraq invaded Kuwait in 1990." See war profiteering for current information. Shortly after taking up the position, the Sydney Morning Herald reported that two eyewitnesses had stated that in late June Iraq's interim prime minister, Ayad Allawi had personally executed up to six suspected 'insurgents' in front of four of his U.S. military bodyguards. Allawi's office denied the witness accounts stating that Allawi had never visited the centre and he did not carry a gun. A graduate of Yale University, he was a career diplomat between 1960 and 1997 serving in eight countries in Asia, Europe and Latin America as well as positions in the Department of State and the White House. According to Foreign Policy in Focus, from 1971 to 1973, Negroponte was the officer-in-charge for Vietnam at the National Security Council (NSC) under Henry Kissinger  While in Vietnam, Negroponte and Richard Holbrooke shared a room. Ambassador to the Philippines (1993-96). From 1997 to 2001 Negroponte worked as Executive Vice President for Global Markets of The McGraw-Hill Companies. Negroponte is a member of the Council on Foreign Relations and the American Academy of Diplomacy. 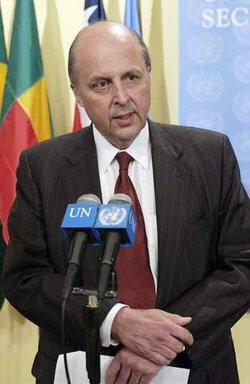 ↑ Biography: John D. Negroponte, U.S. Department of State, accessed April 2008. ↑ John M. (Mike) McConnell, Office of the Director of National Intelligence, accessed April 2008. ↑ Board Members, French-American Foundation, accessed January 22, 2008. Peter Kornbluh (ed. ), "The Negroponte File: Negroponte's Chron File From Tenure in Honduras", National Security Archive Electronic Briefing Book No. 151 - Part 1, April 12 , 2005. Peter Kornbluh (ed. ), "The Negroponte File: Additional Papers Posted on "Special Project", National Security Archive Electronic Briefing Book No. 151 - Part 2, Updated - April 12, 2005. Steve Horn and Allen Ruff, How Private Warmongers and the US Military Infiltrated American Universities, Truthout, 28 November 2011. Scott Horton interviews Steve Horn and Allen Ruff, Training the Next Generation of Imperialists, Antiwar.com, 29 November 2011. NOTE: The section of this article on Negroponte's role in Honduras reproduces part of the Wikipedia profile of Negroponte. This page was last edited on 8 November 2018, at 22:29.